To round out my Dress Code 101 series (where I give you key styling tips on Cocktail, Formal Daytime, Dressy Casual, and Garden Party looks), today we’ll talk about Formal wear!. Sounds pretty easy, right? Well, not always. I can’t tell you how many times I’ve been to formal events where I see people dressed in cocktail attire, which just looks too informal. When preparing a look for a formal event, you’ll need to consider the type of event you’ll be attending (i.e. charity fundraiser, awards ceremony, etc. ), as well as the theme, guest list, venue, location, and activities (for example, if you know you’ll be dancing, you’ll need to select a dress that allows you to move and also won’t get trampled on by others on the dance floor!). While you have the option to pull off a very dressy pant suit look, most women opt for evening gowns for formal events. With dresses, you have a lot more options to choose from such as: ball gowns, fit and flare dresses, trumpet dresses, and more. When it comes to necklines you have a myriad of choices available too! You can go with asymmetric, sweetheart, bateau (or boat) neck, halter, jewel, illusion, etc. When selecting your gown, make sure that it has a good fit, even proportion, and creates a stunning silhouette on you. In many cases, you’ll have to get the dress tailored especially for you which is highly recommended. The last thing you want is to have a lovely evening dress that looks too big or baggy – yikes! Now let’s chat a little bit about color. 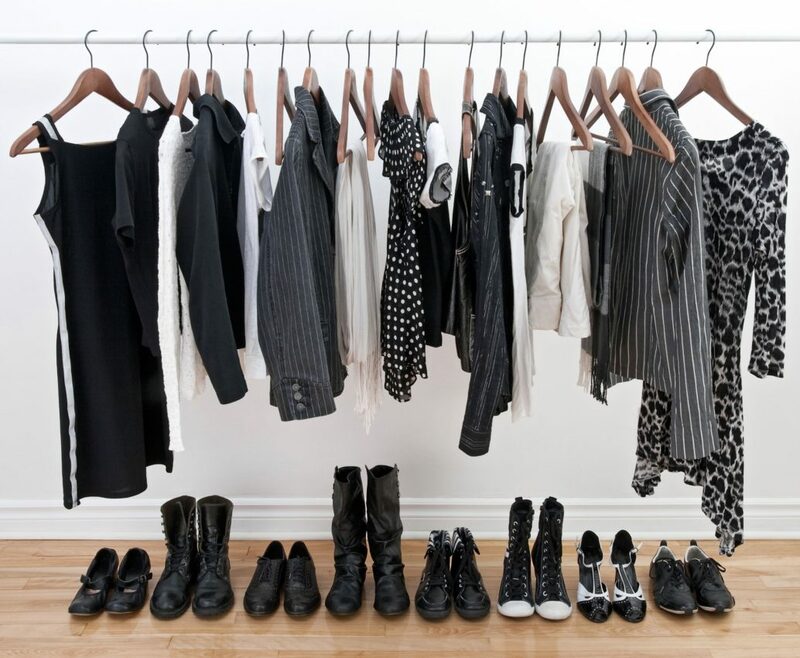 Similar to the Cocktail dress code, when people think of a color to wear, it’s usually black. Not only does black always look elegant in Formal wear, but it’s also very forgiving regardless of your body type. However, formal events are a great opportunity to step in out in jewel tones or deep, rich colors such as eggplant purple. Oh, one more thing about your dress (I’m reminded about a horrific sight that I happened to see in a department store dressing room when shopping with a client yesterday): please avoid dresses that are adorned with tacky, bedazzled pieces! Can you have sparkle in your dress? Absolutely! But it should be tasteful and have a look of refinement about it. Some of the evening gowns I saw yesterday were ‘decorated’ with oversized plastic-looking jewels set in cheap metal and trust me, it looked beyond horrible and ruined what otherwise may have been nice-looking evening dresses. Remember to keep it simple! One of the most fun aspects of pulling together a formal look is accessorizing with jewelry. Again, simplicity and elegance go a long way here. Depending on the style of your dress, you may opt to have a statement necklace or bracelet or earrings complemented with other understated pieces of jewelry. Your jewelry pieces should never compete with each other or the dress! 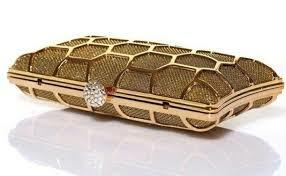 When selecting a handbag to accompany your dress, always try to go with a handheld clutch. You may opt to use a strap it comes with the purse, but I usually recommend that you avoid that because depending on the strap design, it could easily clash with the dress. Overall, purse straps with evening gowns generally look to bulky anyway. 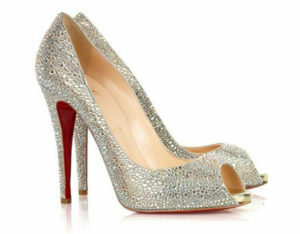 Last but not least, you’ll need to think about the type of shoe for your dress. This is very important, especially if your dress needs to be tailored for length. In this instance, you should shop for your shoe before getting the dress tailored. If you can handle a heel height of about 3-4” you should be in good shape all around. (If not, that’s okay too, but just double check on how that will affect the length of your dress and how it drapes on your body). Also, some people might think that if you wear a long evening gown, you can skimp out on the shoes because they won’t be seen very much. While this may be true, it doesn’t change the fact that it can be seen. 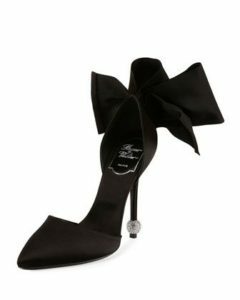 Why go through the time and effort to find an ideal dress and accessories to only fall short in the shoe department – it doesn’t make much sense, does it? 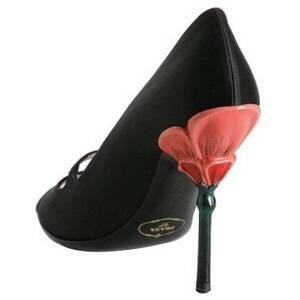 There are plenty of shoe options available including fashionable sandals and pumps. I usually recommend pairing the dress with a shoe of a different, but complementary color. Shoes are a great way to show your own personal style so you have some room to jazz it up here! So now you’re well-equipped to pull together Cocktail, Formal Daytime, Dressy Casual, Garden Party, and Formal looks for different types of events. I hope you’ve enjoyed the series and walked away with some valuable styling nuggets to keep in your back pocket. And, of course, if you need help styling a particular look for a special event, you can reach me here to connect!